When you assess Windows vulnerabilities, start by scanning your computers to see what hackers can see. From there, you can use many of the multiple tools available to steel yourself against attacks. A few straightforward processes can identify weaknesses in Windows systems. 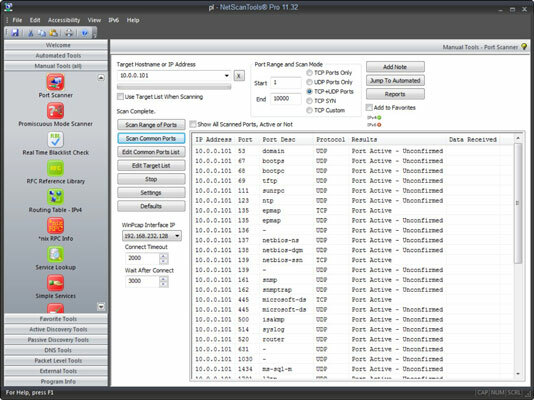 Scan for TCP ports with a port scanning tool, such as NetScanTools Pro. The NetScanTools Pro results show several potentially vulnerable ports open on a Windows 7 system, including those for DNS (UDP port 53); the ever-popular — and easily hacked — NetBIOS (port 139); and SQL Server (UDP 1434). 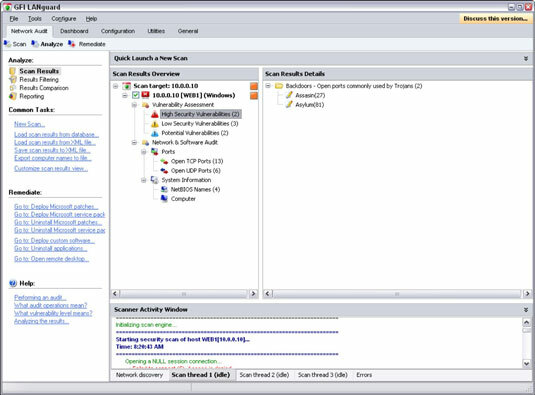 Perform OS enumeration (such as scanning for shares and specific OS versions) by using an all-in-one assessment tool, such as LanGuard. If you need to quickly identify the specific version of Windows that’s running, you can use Nmap with the -O option. Other OS fingerprinting tools are available, but Nmap seems to be the most accurate. This is subjective and might vary from system to system, but what you want to look for are interesting services and applications and proceed from there. Use a network firewall or web application firewall (WAF). Use the Windows Firewall or other personal firewall software on each system. You want to block the Windows networking ports for RPC (port 135) and NetBIOS (ports 137–139 and 445). Disable unnecessary services so that they don’t appear when a connection is made.